December 30, 2009  The veteran NPR journalist, one of the network's most recognizable voices, will continue to be heard on the popular Wait, Wait ... Don't Tell Me! program. December 22, 2009  But the GOP lawmaker says lessons learned may spur bipartisanship on a bill to cut greenhouse gases. December 8, 2009  In an address, the president says staggering job losses mean the country must continue to "spend our way out of this recession" with a round of new incentives for hiring. December 4, 2009  The jobless rate fell to 10 percent in November, from 10.2 percent a month earlier, and employers shed just 11,000 jobs, the fewest since December 2007. But some economists warn unemployment could still head back up. December 2, 2009  Secretary of Defense Robert Gates, Chairman of the Joint Chiefs of Staff Adm. Mike Mullen and Secretary of State Hillary Clinton sought to reassure skeptical lawmakers as they appeared before House and Senate panels to discuss the president's plan to send 30,000 more troops to Afghanistan and set a timetable for withdrawal. 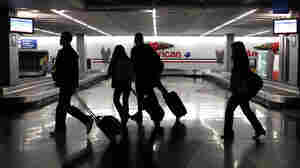 November 25, 2009  The worst recession since the 1930s has caused many Americans to rethink their holiday travel plans. As a result, far fewer are flying, and many are opting not to travel at all just to save money. Among other things, it's bad news for an already struggling airline industry. November 2, 2009  The primary challenger to President Hamid Karzai, who pulled out of a runoff election Sunday, tells NPR that massive fraud "has marred the process" and promises to remain active in Afghanistan politics. November 2, 2009  In an NPR interview, former Afghan Foreign Minister Abdullah Abdullah says it was "a painful decision" to abandon the fraud-marred election in advance of a scheduled runoff vote. 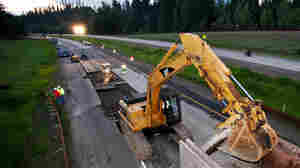 Is The Stimulus Really Working? October 30, 2009  As the recession apparently wanes, the effect the stimulus program had in the turnaround is up for debate. Among other things, the White House claims to have saved hundreds of thousands of jobs, but economists are skeptical. October 9, 2009  As congratulations poured in Friday, White House officials said they were surprised by the Nobel committee's decision. Reaction was mixed in parts of the Arab and Muslim world. September 25, 2009  President Obama, backed by British and French leaders, demanded Friday that Iran open for inspection a previously secret uranium enrichment plant, accusing Iran of breaking the rules of international conduct by concealing the facility. September 22, 2009  President Obama on Tuesday declared that the United States is a serious partner in combating global warming. "We understand the gravity of the climate threat. 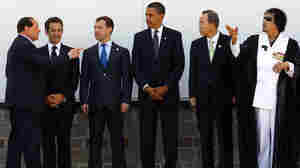 We are determined to act," he said in a speech at a U.N. climate change summit in New York. September 10, 2009  President Obama embarked on what he called "a full-court press" for his health care overhaul, meeting at the White House with nurses a day after his address to Congress and the nation. Republicans, meanwhile, went on the offensive, dismissing the speech as "another lecture" on health care. September 2, 2009  Deputy incident commander Carlton Joseph says investigators have determined that the massive fire north of Los Angeles that erupted a week ago was caused by human activity, but they are still trying to figure out exactly how it started — and whether it was an accident or arson. 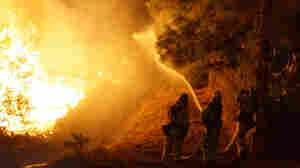 September 1, 2009  Fire officials reported significant progress toward gaining ground on a massive wildfire sweeping through the mountains above Los Angeles, burning scores of homes and threatening thousands more as well as a historic observatory housing some of the largest telescopes ever built.